On Infrastructure : Bikes. Rants. Adventures. I have a love/hate relationship with bike lanes. It was when I found myself behind a Honda Fit with a homemade "STUDENT DRIVER" sign pasted in the back window (Times New Roman, probably size 20 font) on my way home Tuesday I realized I should probably be a bit more careful than usual. Rush hour traffic in downtown with a new driver is generally not a good combination, and of course this point was driven home when Student Driver decided to right hook me. I was in the bike lane with a green light, and the Honda Fit was right next to me. When I was just next to the car (and probably in an unfortunate blind spot) Student Driver turned on the blinker and started to turn across the bike lane into me. Fortunately I was being cautious - I stopped, shouted a combination of "hey/whoa man," and lightly knocked on the window to let them know I was there. Student Driver stopped, and then inched forward straightening out before proceeding to make a right turn across the bike lane, while managing to cut someone off and get honked at. Despite the fact I had right of way, I wasn't going to challenge or harass a student driver, so I let them go with a wave. I have a feeling I freaked them out enough as it is with my window knock and slurred shout. Mostly though, I wanted to know what the law states regarding these situations, so when I got home I did some research. - It is not technically illegal to turn across another lane, but like merging the lane must be clear before turning. - The truly legal (and safest) thing to do is have the car signal ahead, merge into the bike lane before the turn, and then turn. The cyclist, in turn, is supposed to take the lane and pass them on the left. So technically speaking, we were both in the wrong. Since I was going straight and Student Driver hadn't previously merged into the bike lane to turn, I did have the right of way. However, when I saw the turn signal, I should have taken the initiative to pass on the left...a bit difficult though, since I was already on the right. Many cyclists I know scream at the idea of a car entering the bike lane, and many motorists seem to not like the idea of entering "the forbidden lane" (okay, well, some motorists), so this is where my love/hate relationship comes to a point. I love bike infrastructure, but in situations like this I feel like lack of education is a huge issue. It's been proven that having adequate bike lanes and cycle paths is a leading factor in getting people out to ride, and improvements to this sort of infrastructure also help build better and more accessible communities. I know there are plenty of cyclists who are all for being straight vehicular cyclists, but that comes with experience...and you have to ride first. 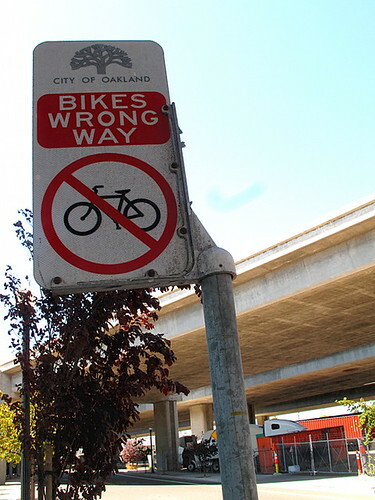 Regarding the aforementioned lack of education, how often have you seen someone going the wrong way, thinking it's okay just because "they're in the bike lane?" Or the people who do unsafe speeds on MUPs and will give you a piece of their mind if you ask them to be careful? And then there are vehicles like the one I encountered where the driver doesn't know how to behave around bike lanes, either turn across them or treating them as a regular lane. 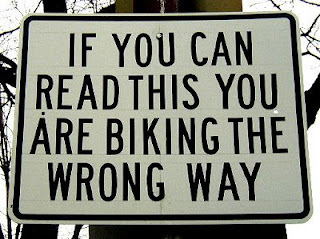 Or the motorists who assume that cyclists will always run signs so they stop when the have the right of way and hold up traffic - I know they're trying to be nice, but it doesn't help. Yes, cars, cyclists, pedestrians, etc., all have these faults, but what I'm trying to say here is that often people use this infrastructure without really knowing how. I've been riding daily for years and try to keep up with the laws pretty well, but even in situations like mine I wasn't entirely sure who in the right. When a new bike lane, box, or path is installed it's generally assumed people will automatically know what to do. Fortunately, some cities are taking initiative to help out a bit. Portland, specifically, has a sign installed to prevent right hooks. Even something like this would help out, I'm sure. I wonder if we'll get any of these in the near future. Photo from here. And Oakland is doing something about the Salmon. I'm tempted to order a couple thousand and install them myself. Photo from here. There's also the not so subtle approach. I'm not at all saying no to bike lanes or similar infrastructure - I certainly welcome more of it - but I do wish that it came with a bit more education for both cyclist and vehicle. A few well placed signs or additions to driver's ED would go a long way, and more classes, billboards, and TV spots (though probably out of the question) would be ideal. And in no way am I knocking Honda Fits. They're good cars.